The UMD discs offer large capacity and the capability to store quality audio/video content, however, the format's proprietary nature and the lack of writers and blank media has made adoption difficult. 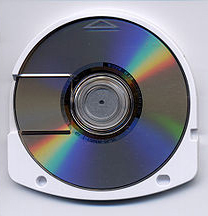 In comparison to Sony's MiniDisc format, there are a number of features lacking; the sliding shield which prevents direct disc contact on MiniDiscs is absent from all UMDs released to date, though it is an option according to the ECMA specification. The smaller capacity of the UMD discs necessitates that bonus content from DVD releases be removed in large part or entirely before the movie is released on UMD for PSP playback. This has made the UMD movie releases a difficult sell in the face of affordable portable DVD players that can output to TV sets and can play the full-featured DVD releases. 2. Auto-Loading: UMDs were designed for possible future slot loading devices with Auto-Loading mechanisms. These would be very similar to the auto-loading mechanism used in slot loading MiniDisc home and car decks. It would also be similar to the VHS U-Matic auto-loading mechanism. Unlike the current clamshell loading design the PSP uses, a slot loading device using an Auto-Loading mechanism would be motorized and completely automatic. You would insert the disc into the device slot, similar to the way you insert a VHS cassette into a VCR, and a disc into the PS3, and as you begin to insert it, the motorized mechanism would then take over and completely draw the disc inside the drive, and complete the loading process. The disc would also be ejected fully automatically by the motorized mechanism, like a VCR. This would also mean that power would be required in order to insert or eject a disc. The UMD format never saw implementation on any device other than the PlayStation Portable. As a result, the market is very limited compared to those for other optical media formats. But, although poor sales early on in the format's life had caused major studios Universal and Paramount to rescind their support, Sony, Columbia, and other film publishers continue to distribute their films on UMD. In late 2009, Sony began pushing developers away from the UMD format and towards digital distribution on the PlayStation Network in preparation for the launch of the digital-download-only PSP Go, which is the first PSP model to not include a UMD drive.